Don’t know what to do with those leftover roasted chicken from last night? Add a little fresh vegetables and some simple sauces to make a quick stir-fly dish, you can have a yummy and healthy dish within 15 minutes. This dish will taste extra good if you cook with a sizzling hot raw cast iron wok (even my husband can taste the difference). Serve this stir-fly broccoli and chicken with steam rice, fried rice or lo mein (a popular Chinese noodles), a meal in 30 minutes is done. 1. Heat up cast iron wok on medium high heat until smoking, add oil and swirl around to evenly cover surface. 2. Add garlic and cook for 5 seconds, stir in carrot slices and cook for 1 minute. 3. Stir in broccoli and salt, cook for 3-4 minutes until broccoli turn a brighter green color. 5. 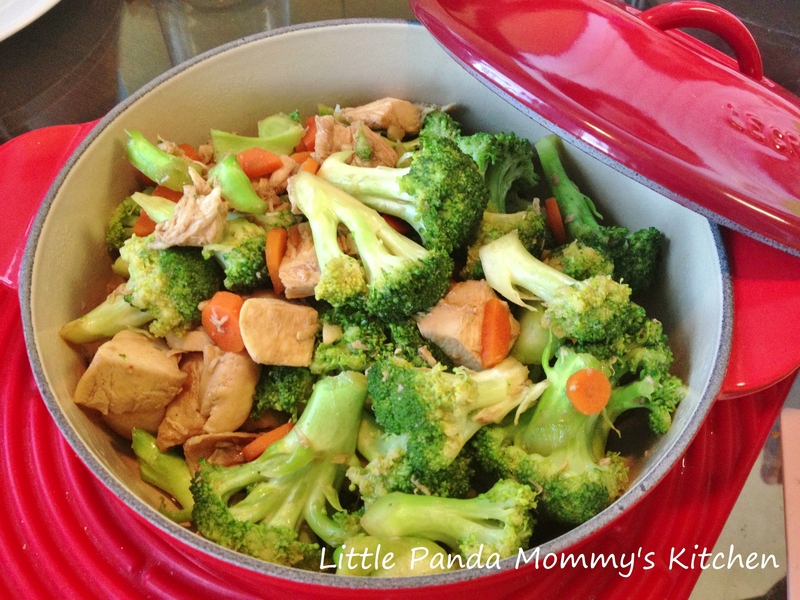 Place stir-fly broccoli and chicken into Le Creuset legumier or any insulated container, serve immediately. 1. You can use stainless steel pan or any other cookware to make the dish, adjust cooking time accordingly. 2. Hot vegetables taste better, cook this one as close as serving time as possible. You may want to serve this dish with steam rice, recipe click here. This entry was posted in Cast Iron Recipe, cook in 15 minutes 15分鐘開餐, Easy Cooking, Healthy Eat, Lodge Recipes and tagged Cast Iron Recipe, cook in 15 minutes ， Easy Cooking, Healthy Eat ， Lodge Recipes on August 16, 2013 by littlepandamommy.